President Donald Trump hosts a lunch with Senate Majority Leader Mitch McConnell (L) and Speaker of the House Paul Ryan (R) at the White House in Washington, March 1, 2017. Intent on repealing health care changes introduced under former president Barack Obama, Republicans have yet to agree on a workable replacement plan. President Donald Trump has laid out changes he wants to make in U.S. health care policies, but his Republican colleagues in Congress remain divided about exactly how to repeal and then replace the national reforms championed by former president Barack Obama. Trump met Wednesday with Republican congressional leaders at the White House in a legislative strategy session, a half day after spelling out details in his address to a joint session of Congress of how he wants to repeal and revamp the Obama health law, popularly known as Obamacare. Trump said he wants to make sure Americans with pre-existing medical conditions can still buy insurance. But rather than forcing Americans to buy medical insurance or pay a penalty if they do not, Trump said a new law should send tax credits to Americans to help them buy their own insurance policies, ones they want rather than ones he said have been "forced on them by our government." He also said he wants to negotiate downward the "artificially high price of drugs" Americans pay for their medical needs, give state governors more flexibility in covering medical costs for poorer people and allow purchase of insurance across state lines in an effort to force insurers to offer competitively priced policies. Republicans have long sought to rescind the 2010 Obama law, saying its mandatory requirement to buy insurance is an unwarranted intrusion by the national government on personal rights, something Trump said "was never the right solution for our country." 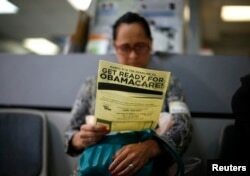 FILE - A woman reads a leaflet on Obamacare at a health insurance enrollment event in Cudahy, California, March 27, 2014. The initiative, launched in 2010 and long scorned by Republicans, has been providing health care coverage to some 20 million previously uninsured Americans. Some Republican lawmakers praised the president's move to detail changes he wants and called it a plausible replacement for Obamacare. But numerous conservative lawmakers balked at the idea of handing tax credits to poorer people to buy insurance, derisively calling the plan "Obamacare Lite." Senator Ted Cruz, one of Trump's main foes for the Republican presidential nomination last year, called the tax credits "a massive and new entitlement program." Other Republicans voiced skepticism whether Trump's plan to give states control over health programs for poorer people would lead to spending rollbacks and possibly leave millions of people with no insurance coverage. Senate Republican leader Mitch McConnell planned to huddle later Wednesday with his 52-member majority in the 100-member Senate to try to reach accord on a plan they all could support. McConnell needs virtually all Republicans to support a repeal and replace plan, because Democrats are virtually unanimous in continuing support for Obamacare, which national surveys show has risen in popularity as Republicans have moved closer to trying to repeal it. Under the law, about 20 million previously uninsured Americans now have coverage to help pay their medical bills. But the cost of the policies has risen, leaving many individuals unable to afford their premiums. About half of Americans have medical insurance through their employers, another third are covered through government programs for senior citizens and poorer people, while the rest have been buying policies under Obamacare or are uninsured.